The dentition of a horse is quite different than humans or many other species. A thorough knowledge of anatomy, eruption times, oral diseases, sinusitis, pathology, breed variations, etc. make it important that your equine veterinary dentist be thoroughly trained and have proper equipment to deal with all the problems that may pop up. Horses are best served by twice yearly dental exams just like us. Most horses will suffice with a once yearly dentistry. Young horses, especially two and three year olds, may need 2 - 3 dentals per year to keep their teeth in the best condition. This is due to the shedding of their molar and incisor caps during this time frame. Between 2 ½ years and 5 years of age horses lose 24 deciduous teeth and erupt 36 - 44 teeth. Numbering systems are used to identify individual teeth for record keeping. The most popular system is the Modified Triadan System. The teeth are numbered by location and quadrant. The upper right is quadrant 1, the upper left is quadrant 2, lower left is quadrant 3 and the lower right is quadrant 4. 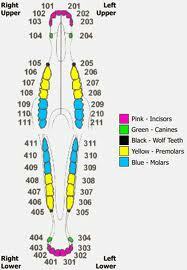 The numbers start with the central incisor being number 1, 2nd incisor is number 2, 3rd incisor is number 3. The canine tooth is number 4. Number 5 is the wolf tooth which is often extracted. There are 3 premolars numbered 6, 7, and 8. They are followed by 3 molars numbered 9, 10, and 11. The Modified Triadan System is used to identify teeth by their location. Horses' ages can be estimated by tooth eruption schedules, amount of wear and changing anatomy of the teeth as they wear. A foal's incisor teeth erupt at approximately 6 days for the first (middle) incisors, 6 weeks for the second incisors, and 6 months for the third incisors. Adult incisors erupt at approximately 2.5 years of age for the first incisors, 3.5 years for the second incisors, and 4.5 years for the third incisors. 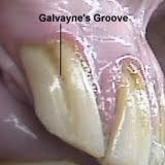 Galvayne's groove is a landmark on the upper corner of the incisors that can be used to age a horse. It appears at age 10, is approximately half way down the tooth at 15, extends to the bottom at 20, will be half gone at 25, and completely gone near age 30. Galvayne's Groove is one indicator of a horse's age. The first set of premolar caps are shed at approximately 2 years and 8 months of age, the 2nd premolar caps are shed at approximately 2 years and 10 months, and the 3rd premolar caps are shed at 3 years and 8 months. This is a total of 12 premolar caps being shed in a 12 month period. Dentistry is important during this time, because if any caps are retained they can cause discomfort and pain, some horses may quit eating or be difficult to ride. Retained caps can even delay eruption of the premolars beneath the tooth. The chart below outlines the normal eruption schedule of equine teeth. A horse should first have a dental exam at birth or shortly thereafter. When we do new foal exams we examine the teeth especially looking for parrot or sow mouth and any signs of cleft palate. Some of these problems may only be corrected early in life. If diagnosed late, treatment options may not be available or the patient won't respond as well to treatment. Horses often have their first dentistry performed as late yearlings as this is when most horses are brought in to begin their training. Training progresses more smoothly and rapidly if the horse has had the wolf teeth removed and the sharp points that can cause cheek and tongue pain removed. Horses showing in longe line classes benefit greatly from dentistry. Because the deciduous (baby) teeth are softer than permanent teeth, these points seem to be sharper and cause more pain than points on permanent teeth. In one study 24% of all young horses with or without symptoms had some form of dental abnormality. In mature horses 80% showed evidence of oral disease or teeth pathology. Many of these problems never occur in horses whose teeth are regularly maintained by an equine veterinary dentist. Learn more in this blog about problems that can occur when routine dentistry is ignored. The chart below shows age related dental abnormalities that are seen on a regular basis. Good dental exams find these problems early so they may be addressed in a timely fashion. Your equine dental care provider should possess a thorough knowledge of all these pathologies and have treatment options available to address each condition. The sinuses of most importance in dentistry are the rostral and caudal maxillary sinuses. The roots of numbers 8, 9, and 10 protrude into the rostral sinus and the roots of #11 into the caudal maxillary sinus. Sinus infections are often associated with abscessed or damaged teeth. Radiographs are sometimes useful in diagnosing infected or abscessed teeth. Some teeth that are fractured or abscessed need to be extracted. Most teeth can now be extracted through the mouth without trephining holes in the skull. The " hypsodent teeth" have long roots that continually erupt to replace tooth material that is lost at the occlusal surface from grinding their food. As horses age the reserve tooth (root) gets shorter until in old age the roots may be quite short. Teeth with short roots are more easily displaced or damaged, so more likely to require extraction. Follow this link to a case study of a molar extraction done here at Conley and Koontz Equine Hospital. Other pathologies include soft tissue trauma, apical infections, periodontal disease, dental decay, fractured teeth, absent cheek teeth, diastema, supernumary teeth, displaced cheek teeth, and abnormalities of wear. Various abnormalities of wear include hooks, ramps, wave mouth, exaggerated transverse ridges, step mouth, shear mouth, incisor malocclusions, and neoplasia (cancer). At Conley and Koontz Equine Hospital we have the special tools needed to extract teeth when necessary. 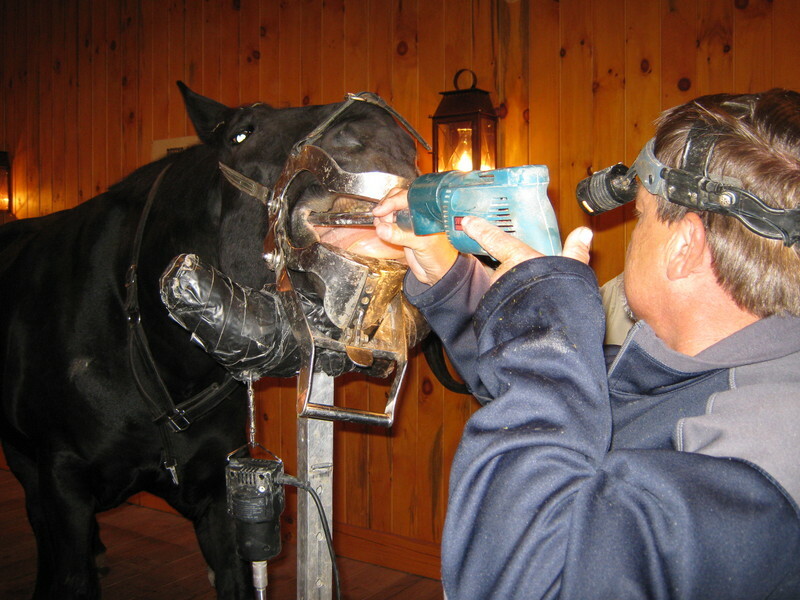 Equine dentistry should only be performed by a licensed veterinarian. In Indiana it is illegal to perform dentistry on horses without veterinary supervision. Though there are "lay dentists" out there, they lack medical training, licensing to use and dispense prescription drugs such as sedation and antibiotics, radiograph and other equipment, and malpractice insurance in the event something goes wrong. To even perform a proper dental examination, the horse will need to be sedated, have its mouth rinsed well of all feed material, proper lighting, and manual palpation of the teeth after application of a dental speculum. The horses head is often rested on a dental stand to keep the head at a level convenient to perform the exam and any treatment necessary. Dental equipment changed rapidly starting in the late 1980s and continuing into the present. The use of dental speculums, good lighting, motorized equipment, and the manufacturing of lost and new equine dental tools have all led to advanced and more comprehensive dentistry than was ever possible before. Safety of the horse, the assistant, and the veterinarian are of utmost importance. A safe area to work in should include a flat floor; be free of objects such as water buckets, hoses, and tools; and provide some restraint. A set of stocks is ideal but is not always available. Positioning a horse with its hindquarters in a corner prevents backing up. Electricity and water should be available but not in the way of maneuverability. Horses typically resent having a speculum put on or having objects inserted into their mouths, even more so if they are in pain. Horses can rear or strike out. For these reasons we sedate the horse for these procedures.The drugs used to provide sedation and analgesia are prescription drugs and should be given only by a licensed veterinarian. These drugs are most often given by IV injection. Accidentally injecting into a carotid artery can cause severe adverse reactions including death. Drug dosages vary greatly between breeds and ages of horses with some horses being very sensitive while others may need more to achieve safe working conditions. In our hospital or on your farm, we feel we can provide the highest quality of equine dentistry performed anywhere. You can learn more about our dentistry services and syptoms that may indicate you horse is in need of dentistry at our dental services page. If your horse has any dentistry problems or just needs routine dental care, please contact us at 877-499-9909 or info@ckequinehospital.com.